Mostly on the couch. Daily time spent by US households in leisure & sports (in hours, 2016). (Click on the image to enlarge) On an average, the US household spends about 6-7 hours a day in leisure & sports–when not working, sleeping or doing household chores. Half of these are spent in watching TV (the Netflix stock price seems to support this). Unfortunately, less than half an hour goes in each of the more meaningful activities like reading, exercising or relaxed thinking. The only other activity with slightly more time is socializing. The data suggest men get almost an hour extra time than women. That shouldn’t be a surprise since women are more involved in daily tasks around kids and cooking food. However, most of that time for men goes into watching TV confirming strong male focus on content by Netflix & cable companies. Only in socializing and reading, women spend few minutes more than man. 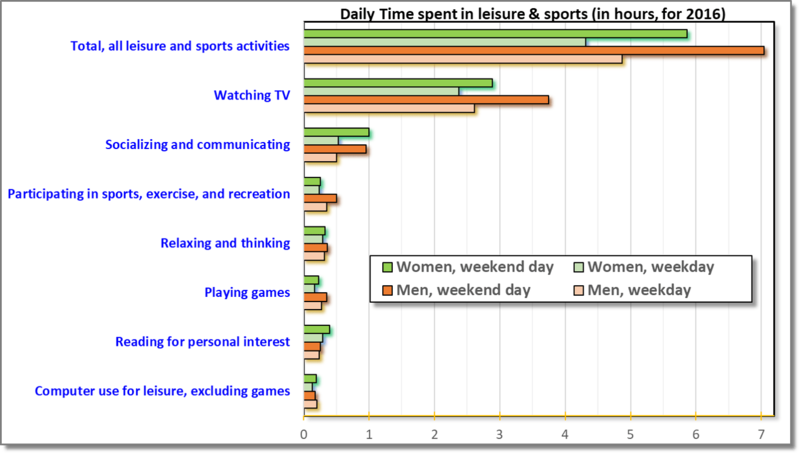 Over weekend, households spend 2-3 more hours in leisure & sports. While men get more than 2 hours extra, almost half of it goes in watching TV. This extra time does allow time to exercise, read & relax. For women, the weekend adds only about an hour to the free time, suggesting many more women are involved in household activities that get pushed to weekend, for example doing chores for kids.